I certainly do not believe the wild alien theories or other Out There things you'll find on other Internet sites. I know neither Schoch nor West fit this category, either. At least as relates to the Great Sphinx--I don't know much of what else they have argued. I personally don't believe in an advanced lost civilization pre-dating the Egyptians because the archaeological record doesn't provide evidence for it, so that's why I try to present a strong counter-argument when Schoch and West are brought up. Well, just for the record, West actually was busy putting down lots of crazy theories in our tour group. There was an image in a tomb of gods with heads that looked like round domes and little antennae sticking out. EVERYONE in the tour group (except my husband and I) thought they were aliens! Honestly. West shot it down immediately and said they were either beetles or catfish, but certainly not aliens. He actually kept saying "I don't think so" to 90 percent of the strange ideas people had, and pretty much stuck to traditional theory of the engravings and hieroglyphic meanings. I'd say he is about as mystical as a longshoreman. No arguments over here. I respect all opinions, except the ones involving aliens! LOL Now you've gone and made me very curious, bastetmax. Was this a tomb on or near the Giza Plateau? Do you remember to which period it dates or to whom it belonged? Did the gods with the odd heads look like the fellow on the left in this image? Sorry about all the questions. I'm just interested to know more. I'm glad West tried to set them straight. One thing you have over me--big time!--is that you've actually been there, yourself. I've been studying Egypt for twenty years but have never been able to travel there. 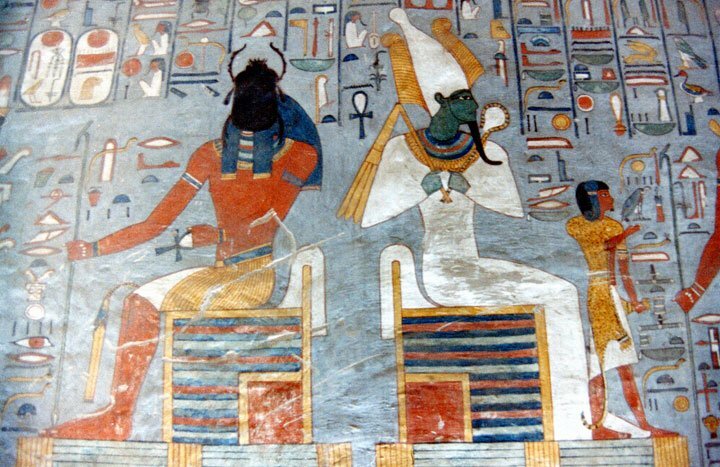 Egyptian artwork, and particularly portraits of deities, can be very confusing to laypeople if they don't understand what they're seeing, and so they often attach wild explanations to things. No It wasn't Khepri. I'd know him. They look just like a catfish, really. Or they could be a crudely drawn beetles. Not all the tomb paintings were are well done as others. This was in the Valley of the Kings and I don't know what tomb. (I was indisposed that day--drat!--and my husband took the pictures and gave me a full report.) I'll go through my husband's pix sometime and see if I can find the catfish/beetle guys. But, really, if they were supposed to be aliens, I can't imagine that it would be a 1950s style Robbie the Robot, you know? People who describe aliens mention dark almond-shaped eyes and a small face, etc. You know what I'm talking about. These guys looked like...catfish! I know how you feel about not getting over there after all that study. I'd say I've got 10 years of study (all amateur) and finally said, dammit, I'm going. The war had me really worried for a while, but I never felt so safe. They had army escorts for our bus convoys on all the rural roads, and there were machine gun nests every mile or so. They are seriously trying to protect the tourist trade. People who describe aliens mention dark almond-shaped eyes and a small face, etc. You know what I'm talking about. These guys looked like...catfish! I think I may have found your catfish, bastetmax. Something about it seemed familiar from a book I had read by Erik Hornung on the royal books of the netherworld, so I went searching for images relating to those texts. I don't know if the tomb to which you refer belonged to a royal or a noble, but your husband was probably looking at some version or excerpt of a text called the Book of Caverns. This text originates around Dynasty 20, if I remember correctly. It was sometime in the late New Kingdom, in any case. I don't know the reason that these gods should have catfish heads. There's a dizzying array of deities in all of these netherworld texts and some of the gods look just plain bizarre. Hornung states these figures "...are elsewhere encountered as assistants of Aker and representatives of the dark depths of the earth and of water" (Hornung 1999: 86). It may be their association with water that lended these deities their unusual heads. Aker is one of the oldest of all Egyptian deities and was an earth god, as well as the guardian of the gates of dawn. The image I came up with is not so great, so if you ever manage to find your husband's photograph I'd love to see it. The war had me really worried for a while, but I never felt so safe. They had army escorts for our bus convoys on all the rural roads, and there were machine gun nests every mile or so. A lot of Western people have those worries in general about travelling to the Middle East, but these days in particular. I'm not surprised it worked well for you. A friend of mine is from Egypt and travels back there several times a year, and he says one of the best times to visit his country is when there's serious unrest pretty much anywhere in the Middle East. Tourism is down and you have the temples and tombs to yourself. Not quite the same catfish. The gods in question had eyes, but they were basically the same. If I could dig up the picture and then figure out how to post it to the list. I guess I'd have to have uploaded to a Web site? How do you do it? Anyway, the gods in those registers were truly bizarre. Some didn't even have heads! As for having the tombs to ourselves, I think a lot of credit goes to the tour leader for knowing when to go, whether at 5 in the morning or at lunch hour. We still had a hard time avoiding the Japanese, who were everywhere--and arriving in giant tour buses. Frankly, we saw every nationality except Americans. Very strange, because when people asked about our nationality, we didn't lie, just said "Americans" and no one gave us a hard time at all. One guy found out we were from Chicago and he brightened up and said "Chicago Bulls." Then he shook our hands. Thank you, Michael Jordan! Yeah, I couldn't find any good images of the catfish-heads on the Web. The one I posted is just a line-drawn rendering of the real thing. I'm pretty sure it was something like the Book of Caverns or an excerpt thereof that your husband saw. We still had a hard time avoiding the Japanese, who were everywhere--and arriving in giant tour buses. It's always interesting how the entire world seems to be enthralled by Egypt. The Japanese are no exception, and in fact they have contributed a lot of important information to our overall knowledge through their own university research and excavations. One guy found out we were from Chicago and he brightened up and said "Chicago Bulls." Then he shook our hands. Thank you, Michael Jordan! Ah, sports, the universal language. LOL I never noticed your profile and didn't realize you're from Chicago. I'm pretty bad about checking people's profiles here. Maybe I've seen you at the Field Museum or Oriental Institute. I'm a docent at both places. We actually chatted in the Welcome area when I first joined. I was wondering why the Field doesn't offer hieroglyphics classes anymore and you explained it to me. Oh, I remember that now. Please forgive my utterly terrible memory. Never mind. Happy New Year!